BACKGROUND AND PURPOSE: Cellulose porous beads (CPBs) are a new, exceptionally uniformly sized, nonabsorbable embolic agent. We evaluated their efficacy in the preoperative embolization of meningiomas. METHODS: In 141 consecutive patients, we used CPBs (200-μm diameter) for the preoperative embolization of meningiomas. We selected patients whose tumors were ≥4 cm with 50% of blood to the tumor supplied by the external carotid artery (ECA). All patients underwent a provocation test before embolization. The percentage of blood supplied to the tumor by the internal carotid artery and ECA was determined angiographically. Nonenhanced areas on postembolization MR imaging were calculated. Intraoperative blood loss, units of blood transfusion, and hemostasis at the time of surgery were recorded for each patient. The interval between embolization and surgery was intentionally longer than 7 days. RESULTS: Of the 141 patients, 128 underwent CBP embolization. Eleven patients had positive provocation test results, and 2 had vasospasm; they were not CBP embolized. In 72% of the patients CBP embolization achieved reduction in the flow of the feeding artery by more than 50%. The nonenhanced area on MR imaging was not significantly correlated with the degree of ECA supply or devascularization. The interval between embolization and surgery was 8–26 days (mean, 9.9 days). The longer this interval, the greater was the tumor-softening effect and the rate of tumor removal. CONCLUSIONS: CPBs may be useful for the preoperative embolization of meningiomas. To increase the efficacy of CPB embolization, the interval to surgery should be at least 7 days. Preoperative embolization of meningiomas is commonly used to reduce intraoperative blood loss.1–3 We have developed a particulate material—cellulose porous beads (CPBs; Asahi-Kasei, Nobeoka, Japan)—that consists entirely of cellulose; it is exceptionally uniform in size, positively charged, and has a specific gravity similar to whole blood. We previously reported the properties and characteristics of this material and studied CPB embolization techniques in an animal model.4 We also performed a preliminary clinical trial.5 We now routinely use 200-μm-diameter CPBs because they can flow to the tumor and penetrate well into the vascular bed without occluding precapillaries in the tumor bed.4,5 The greatest degree of tumor softening was observed longer than 7 days after embolization.6 On the basis of these data, we subjected a large number of patients with meningioma to preoperative CPB embolization. Our study protocol was approved by the institutional ethics committee; prior informed consent was obtained from all patients or their closest relatives. Between July 1996 and March 2004, 203 patients (145 women and 58 men; mean age, 56.6 years; age range, 26–81 years) with intracranial meningioma were treated at our institution. The imaging and medical records of all 203 patients were retrospectively reviewed. All patients underwent radiologic evaluation with CT and MR imaging scans. The tumor size and location were recorded in each patient. In all patients we used a transfemoral approach under local anesthesia. For conventional angiography, we employed a digital subtraction angiography (DSA) technique with bilateral selective catheterization of the external and internal carotid arteries (ECAs and ICAs). The ratio of the blood supply to the tumor derived from the ECA and ICA was determined. Subjective assessment of the proportion of the tumor vasculature supplied by internal and external systems was based on the degree of blush within the tumor on DSA images (anteroposterior and lateral views). The ECA:ICA blood supply ratio was independently determined by 2 neuroradiologists and expressed as 100:0, 90:10 . . . 10:90, 0:100 at 10% intervals. For the current investigation we selected patients whose meningiomas were at least 4 cm in diameter on MR imaging and/or CT scans, whose ECA supplied more than 50% of the blood flowing to the tumor, and who demonstrated diffuse homogeneous contrast accumulation that persisted into the venous phase at angiography. Embolization was performed in the interventional neuroangiography suite by using high-resolution DSA and the road-mapping technique. A 6F guiding catheter (Medikit, Tokyo, Japan) was inserted through a 6F sheath introduced into the femoral artery. The patients received an intravenous 3000-U bolus of heparin; this was supplemented with 1000 U of heparin every hour, as needed. A microcatheter tip (Tracker TURBO-18; Target Therapeutics, San Jose, Calif) was inserted at a distal site into the artery feeding the external carotid system. After superselective angiography, we obtained external carotid angiographs by propelling a microcatheter from a guiding catheter. In this way, we were able to obtain information on the distal feeding artery. In cases with stasis of the contrast medium in the feeding artery, the tip of the microcatheter tended to be wedged in the feeding artery. To perform more effective embolization, we retracted the microcatheter until recognition of distal site without stasis of the contrast medium. Under these conditions, the CPBs, aided by the bloodstream, traveled further along the feeding artery. We carefully analyzed the angiographic findings by using continuous-mode DSA (20 frames/s). None of the patients underwent embolization of branches of the ICA. 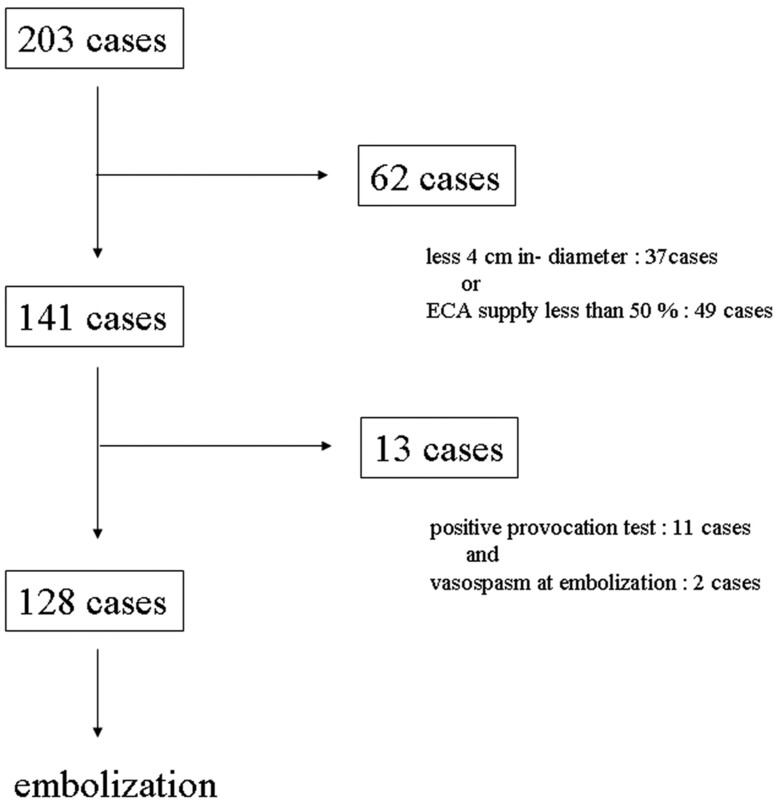 Provocation test by using amytal (40 mg) and/or lidocaine (40 mg) was performed before ECA embolization. Patients with negative results underwent embolization with 200-μm-diameter CPBs. The beads were suspended in iodinated contrast material (about 2000 CPBs/mL) and sterilized in vapor at 121°C at 11 Pa for 20 minutes; the sterility of each batch was confirmed with bacteriologic tests. Embolization was performed under fluoroscopic monitoring by slowly injecting the beads through the microcatheter until intratumoral perfusion showed evidence of stagnation. Where technically feasible, this procedure was repeated for all tumor-supplying vessels. After embolization, the degree of devascularization was graded as total, significant (>50% flow reduction), and partial (<50% flow reduction) by 2 neuroradiologists blinded to patient data. In cases with incomplete ECA embolization, the reason (eg, vasospasm, dangerous anastomoses) was noted. Within 2–3 days after embolization, we performed the first MR imaging study; subsequent MR imaging scans were obtained at more than a week postembolization in patients scheduled for intentionally delayed surgery. All MR imaging examinations included T1-weighted spin-echo scans before and after the intravenous injection of gadolinium-diethylene-triaminepentaacetic acid (Gd-DTPA; 0.1 mmol/kg body weight) in the sagittal, axial, and coronal planes. Pre- and postembolization MR imaging was performed on the same imaging system by using the same field strength, identical imaging parameters, and identical planes of acquisition; all images were photographed with identical window settings. Computer-aided volumetric measurements were calculated from MR images obtained before and after embolization. Calculations were based on T1-weighted contrast-enhanced images. Parts that were not enhanced on postembolization scans were considered to be devascularized tumor regions. They were used to calculate the percent reduction of the enhanced area. We analyzed the nonenhanced area on postembolization MR imaging scans on the basis of the ratio of blood supplied to the meningioma by the ECA and ICA. In cases where intratumoral hemorrhage or a change in perifocal edema was recognized on MR imaging scans, the degree of these abnormal findings was recorded. Before 1996, patients underwent surgical tumor removal within a few days after embolization (group 1). After 1996, we intentionally prolonged the interval between embolization and surgery to longer than 7 days because the greatest degree of tumor softening was observed after 7 days postembolization.6 These patients were categorized as group 2. The microneurosurgical procedures involved excavation of the central tumor mass by suction, with an ultrasonic surgical aspirator (Sonopet UST-2000; M & M, Tokyo, Japan), or by cutting with scissors to remove the tumor completely. The surgeon reported the consistency of the tumor during surgery and recorded microscopic findings. The tumor consistency was divided into soft (allowing removal of >50% of the tumor volume with suction or low-power [10%–30%] aspiration), moderately hard (allowing removal of >50% of the tumor mass with high-power [40%–100%] aspiration), and hard (requiring the use of scissors to resect >50% of the tumor volume). The Mann-Whitney U test was used to determine the statistical significance of differences. Statistical significance was defined as P < .05. Of the 203 meningiomas, 166 (81.8%) measured >4 cm in diameter and 154 (75.9%) received >50% of their blood supply from the ECA. We selected 141 patients whose meningiomas were both >4 cm (range, 4.0–8.9 cm; mean, 5.8 cm) and received 50% of their blood supply from the ECA (Fig 1). Of the 141 tumors, 36 (25.5%) were located at the sphenoid ridge, 21 (14.9%) at the frontal base, 16 (11.3%) at the convexity, 8 each (5.7%) in the cavernous sinus and at the cerebello-pontine (C-P) angle, 6 each (4.3%) in the middle fossa and falx; 18 (12.8%) were parasagittal, 13 (9.2%) petroclival, and 9 (6.4%) occipital. There was no correlation between tumor size and location. Of 141 meningiomas, 50 derived their blood supply entirely from the external carotid system, and the other 91 were fed at different ratios by the external and internal carotid system. The range of flow from the ECA was 50%–100% (mean, 76.1%). Of 101 skull-base meningiomas (ie, petroclival, cavernous sinus, sphenoid ridge, frontal base, middle fossa, and C-P angle tumors), 72 were supplied from the internal and external carotid system. The mean ratio of the external carotid system supply was 71.3%. Of the 40 meningiomas that were parasagittal or located at the convexity or falx, only 2 derived their supply from the ICA (anterior falx artery from the ophthalmic artery). The mean ratio of the external carotid system supply was 95.0%. Of 141 patients selected for this study, 13 did not undergo ECA embolization: 11 because they had positive provocation test results (lidocaine positive, n = 10; lidocaine and amytal positive, n = 1) and 2 because they had vasospasm. Satisfactory and technically easy and safe CPB embolization was achieved in the remaining 128 patients (Fig 1). We encountered no aggregation of particles or catheter obstruction by particles in this series. Angiographically, satisfactory stasis was noted in the immediate postembolization phases; the CPBs produced a rapid and drastic reduction in blood flow. The degree of angiographic devascularization was total in 29 cases (22.7%), significant in 63 (49.2%), and partial in 36 (28.1%). Postembolization contrast-enhanced MR imaging showed nonenhanced lesions within the tumor in all but 3 patients. The nonenhanced area ranged from 12% to 81% (mean, 38.3%) of the tumor area. Although tumors that derived most of their supply from the ECA tended to manifest large nonenhanced areas on postembolization MR imaging scans, there appeared to be no significant correlation between the ratio of the ECA supply and the size of the nonenhanced areas. As shown in Figure 2, the degree of devascularization was not significantly correlated with the size of the nonenhanced areas. In 3 cases, the apparently complete occlusion of feeders supplied exclusively by the ECA did not result in a significant reduction of the enhanced area on postembolization MR imaging. In 25 patients in whom the nonenhanced area within the tumors exceeded 50% on both immediate and delayed postembolization MR imaging, there was no change in the devitalized area (Fig 3). 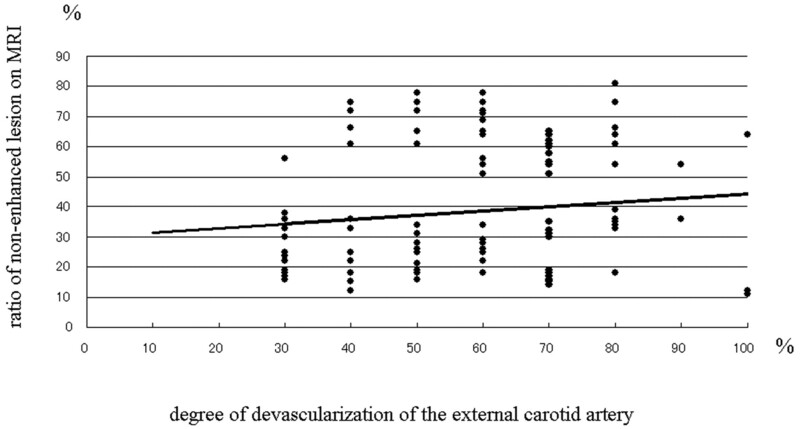 Graph showing the relationship between the ratio of nonenhanced lesions on postembolization MR imaging scans the degree of devascularization of external carotid artery feeders. The regression line obtained by applying simple regression is shown (y = 0.1437x + 29.994; R2 = .0162). A, Pre-embolization Gd-DTPA-enhanced T1-weighted MR imaging scan showing a well-enhanced lesion in the right medial frontal area. B, Three days after embolization, the enhanced MR imaging scan shows a heterogeneous nonenhanced lesion in the tumor. C, Seven days postembolization, the nonenhanced lesion in the tumor was not remarkably changed. Of the 203 patients, 75 were operated on before (group 1) and 128 after 1996 (group 2); the interval between embolization and surgery was intentionally prolonged in group 2. Intraoperatively, the surgeon commented that embolization facilitated surgery in almost all patients; visible devascularization, manifesting as obviously pale areas in the central portion of the tumor, was observed in 22 patients, all of whom had only ECA feeders. Of the 128 group 2 patients, 31 (24.2%) had hard tumors, 75 (58.6%) had tumors of moderately hard consistency, and the remaining 22 (17.2%) had soft tumors; 68.9 ± 5.9%, 71.5 ± 6.8%, and 78.5 ± 7.1% of the hard, moderately hard, and soft tumors, respectively, derived their blood supply from the ECA. Although the incidence of soft tumors tended to be higher in patients whose meningiomas were supplied by the ECA (Fig 4), there was no significant correlation between postembolization tumor consistency and the route of blood delivery. The area of nonenhancement was 23.4 ± 5.5%, 33.8 ± 8.3%, and 72.5 ± 7.6%, respectively, in hard, moderately hard, and soft tumors, and tumor consistency was significantly correlated with the size of the nonenhanced area (P < .01, Fig 5). 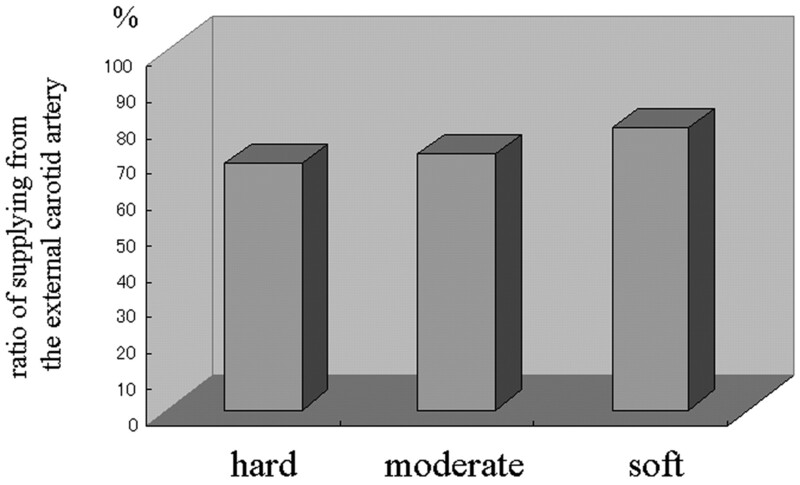 Bar graph showing the relationship between the ratio of supply from the external carotid artery and tumor consistency at surgery. Bar graph showing the relationship between the ratio of nonenhanced lesions on postembolization MR imaging and tumor consistency at surgery. *P < .01. In group 2 (n = 128), the interval between embolization and surgery was 8–26 days (mean, 9.9 days); the total blood loss was 987 mL, and the blood loss during tumor removal was 424 mL. Blood transfusions ranging from 1.0 to 6.0 U (mean, 2.1 U) were required by 13 patients. The Simpson grade at surgery was 1.91 on average, and the length of hospitalization was 27.6 days. In group 1 (n = 75), the interval between embolization and surgery was 1–7 days (mean, 2.1 days). Of the 75 tumors, 50 were hard, 20 were moderately hard, and 5 were soft; the total blood loss was 897 mL; and the blood loss during removal of tumor was 534 mL. As shown in Table 1, the difference between groups 1 and 2 with respect to tumor consistency was significant (P < .01). Blood transfusions ranging from 1.0 to 9.0 U (mean, 2.9 U) were required by 27 patients. The length of hospitalization was 20.7 days. These parameters were not significantly different between group 1 and group 2. On the other hand, the Simpson grade at surgery in group 1 averaged 2.60 and was significantly different from that of group 2 (Table 1). Comparison of the 2 groups showed that imposition of a longer interval between embolization and surgery increased neither the intraoperative blood loss nor the risk of complications. In all patients with embolization-induced tumor softening, removal of the tumor was easy and could be accomplished without injury to adjacent vital structures. Of the 203 meningiomas treated at our institution, 109 (53.7%) were meningothelial, 22 (10.8%) fibroblastic, 45 (22.2%) transitional, 21 (10.3%) angiomatous, 5 (2.5%) atypical, and one (0.5%) microcystic. 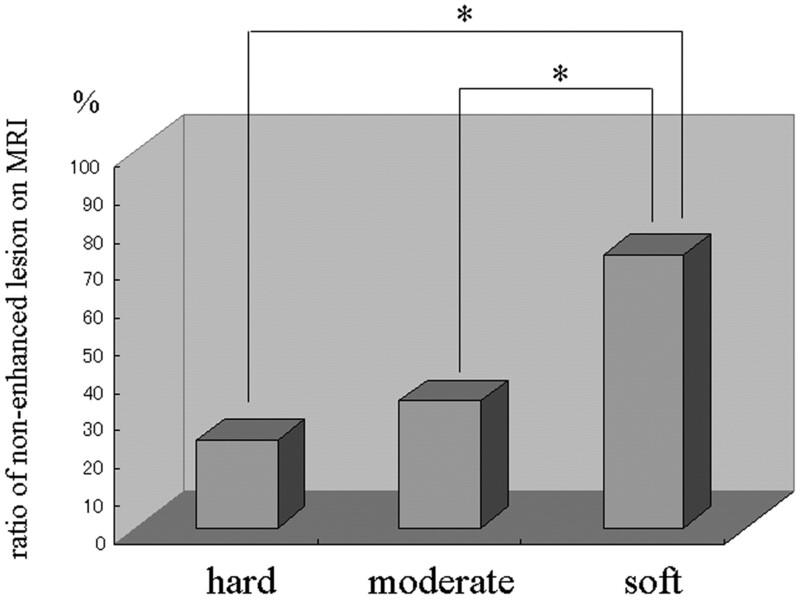 We found no correlation between the histologic subtypes and the degree of tumor softening between the 2 groups. Among the 128 group 2 patients, 2 with a massive meningioma suffered intratumoral hemorrhage leading to cerebral edema. In another patient, provocation test results were negative with both lidocaine and amytal; this patient exhibited permanent hearing disturbance on the side ipsilateral to the embolized tumor. Complications related to CPB embolization occurred in 2 group 1 patients: one developed intratumoral hemorrhage and the other cerebral edema. Currently used embolic materials are nonabsorbable, and the particle sizes are accurately calibrated. Microspheres can travel further than irregularly shaped particles and can produce homogeneous and complete occlusion.11–25 Our laboratory developed a solid embolic agent consisting of CPBs that are exceptionally uniform in size and have a specific gravity similar to blood and a net-positive charge.4,5 We now routinely use 200-μm CPBs that can flow to the tumor and penetrate well into its vascular bed without occluding precapillaries in the tumor bed.4,5 The greatest degree of meningioma softening was observed after 7 days postembolization,6 which confirmed that the embolic materials must be nonabsorbable and appropriately sized for successful embolization. Accurate preoperative evaluation of embolization efficacy remains difficult. Grand et al26 obtained an excellent correlation between the amount of tumor embolized on MR imaging scans and the estimated blood loss at surgery. Others3,27 have reported that apparently complete occlusion of the ECA supply on angiograms did not result in a significant reduction in the enhanced areas on postembolization MR imaging scans. We demonstrated that the ratio of ECA:ICA blood supply to the tumor plays an important role in the size of the nonenhanced area on postembolization MR imaging scans. In our series, tumors supplied by the ECA tended to manifest larger nonenhanced areas on postembolization MR imaging scans, though the difference between ECA- and ICA-supplied meningiomas was not significant. Moreover, we did not note a significant difference between the degree of devascularization and the size of the nonenhanced area on postembolization MR imaging scans. We found that, in some patients with apparently complete angiographic occlusion of feeders supplied only by the ECA, there was no significant reduction of the enhanced area on postembolization MR imaging scans. These observations confirm again that it is difficult to assess the degree of embolization on contrast-enhanced conventional MR imaging scans. According to earlier reports,26 even if the feeding arteries were completely embolized, the nonenhanced area on MR imaging scans was not necessarily large. We posit that the size of the embolic particles may have been suboptimal, resulting in only proximal occlusion of the feeders. Our 200-μm particles were able to penetrate sufficiently deep into the tumor and completely occlude the feeding artery. In fact, intratumoral vessels in our surgical tumor specimens contained embolic microspheres.5 Alternatively, earlier embolic materials may have been prevented from penetrating sufficiently deep into the tumor by spasms in the feeders during their delivery. Under such conditions, even if feeders disappear on DSA, nonenhanced lesions will not be visualized on MR imaging scans. These observations indicate that care must be taken in the catheterization of the feeding artery and the delivery of the embolic material. Because we previously found the greatest degree of tumor softening at longer than 7 days postembolization, in this series we deliberately delayed surgery. In patients with embolization-induced tumor softening, tumor removal was easy and could be accomplished without injury to adjacent vital structures. The softening effect was particularly useful in skull-base meningiomas. In the delayed-surgery group (group 2), less time was required for the surgical procedures, and the Simpson grade at surgery averaged 1.91 compared with 2.60 in group 1 (P < .01). According to Manelfe et al,1 very distal embolization may lead to occlusion of small vessels in the tumor bed and softening and necrosis of the central tumor portion. Consequently, tumor retraction is facilitated and a cleavage plane is established between the tumor and brain. Access to the cortical supply of the tumor allows for hemorrhage control before resection of the bulk of the tumor, rendering tumor removal more simple and safe. Increasing the interval between embolization and surgery prolonged the overall hospitalization of meningioma patients, though it did not increase the incidence or severity of complications. In situations where the additional hospitalization days present a hardship, patients could be discharged after embolization and readmitted for surgery. Preoperative CPB embolization is safe and efficacious in patients with meningioma. Injection of the CPBs was smooth and no clogging of the microcatheter occurred. Prolongation of the interval between embolization and surgery rendered the tumors softer and their removal easier and without inflicting injury to adjacent vital structures. Accepted after revision October 2, 2005.